MONTEVIDEO, Uruguay -- Laura Andrade recently walked out of a pharmacy in Uruguay cursing loudly because she couldn't buy legal pot. The wine sommelier had taken a bus since pharmacies in her neighborhood don't sell the drug, but a pharmacy employee told her to come back the next day. "I work, I can't come here every day," she complained. "Today, I'll have to buy from an illegal dealer. I have no choice. This system is crap. It's useless!" Marijuana went on sale in Uruguay last year under a 2013 law that made it the first nation to legalize a pot market covering the entire chain from plants to purchase. But the country is still working out how to meet demand in its effort to undercut drug traffickers who control the black market. Marijuana Nation: Full coverage of pot in the U.S.
"The demand is greater than our productive capacity," the head of Uruguay's National Drugs Council, Diego Olivera, told The Associated Press. "We have to address that challenge." It's exactly the opposite of the problem facing some U.S. states that have legalized marijuana -- an oversupply. Oregon and California have such a glut that sellers are slashing prices. 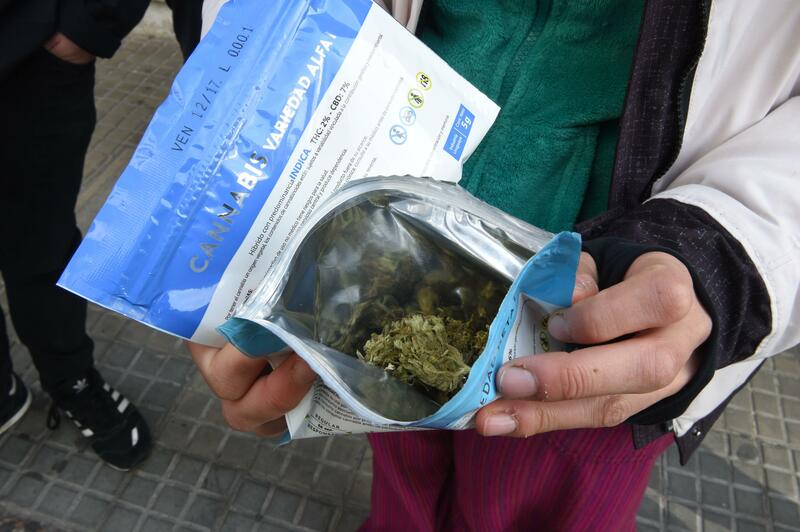 In Uruguay, even finding legal marijuana can be a chore, as Andrade discovered. The law lets registered users buy as much as 40 grams (1.4 ounces) of marijuana a month at participating pharmacies. But only 14 of the country's estimated 1,200 pharmacies have signed up to sell marijuana. Many balked at the idea of selling the drug, due to low profit margins or fear of being robbed. The law also allows the growing of pot by licensed individuals and the formation of growers and users clubs. Olivera estimates 20 to 25 metric tons of marijuana are consumed annually between the legal and black market, and academic studies say the figure could be as high as 30 metric tons. That's about three times what the legal system could now provide at full capacity, and officials say it's actually been producing less. Two companies are licensed to produce a total of 4 tons combined for sale to pharmacies, but officials say they only recently began meeting that target. Olivera said officials are considering granting more licenses. "There was no experience with farming on a large scale and it took a while to finally nail the technology, the workforce and the drying process," Olivera said. Harvesting the marijuana was a difficult process from the start, said Eduardo Blasina, an agronomy engineer who held a minority stake in the companies that supply pharmacies. "It's a complex crop, and the investors behind these companies didn't come from a culture of cannabis," he said. "You'd tell them: You need to buy 50 fans, something that's very necessary in some instances, and they'd look at you as if you were an alien." Uruguay's 8,750 registered individual growers are allowed to harvest up to 480 grams (a little over a pound) each per year. If all met that figure, it would total about 4 tons per year. There are also 90 users clubs with 2,529 members. If they were to produce their maximum amount, it would come to about another ton annually. An estimated 147,000 Uruguayans between the ages of 18 and 65 consume marijuana, with about a third of them using it weekly. But so far only about 35,000 have registered to use the legal marijuana system. Even with legal users sharing their pot, Uruguay's cannabis control institute says that the regulated market reaches just about half the country's users. Most of Uruguay's 19 provinces still don't have marijuana dispensaries, even though the number of people registered to buy at the pharmacies has jumped from 4,959 when the sales began in July 2017 to 24,117 today. Pharmacy employee Lino Celle says marijuana arrives once a week at his business. "They're supposed to provide us with about 4 kilograms, but only leave us 3," he said. "The system is ridiculous. I live far away, work and study. It's too complicated to buy like this," said a local chef who asked to remain anonymous because he doesn't want to be stigmatized for smoking pot. "I'm here to buy it but they won't sell it to me because I came some hours early" at a pharmacy that distributes marijuana on an appointment basis. "If the law says this is legal, what's the problem?" Some complain about the quality. "This is the last time we buy," said Jose Luis Bertullo who came to the pharmacy with his partner, Jazmin Texeira. "This marijuana doesn't really hit you as much," he said, adding that the two want to register to grow their own. "It will be much better to have our own little plant," he said. Uruguay launched its government-regulated marijuana marketplace in an effort to fight rising homicide and crime rates linked with illicit drug trafficking. Yet drug violence has increased since the law went into the effect. Interior Minister Eduardo Bonomi says fights between criminal gangs, mostly associated with drugs, made up 59 percent of all homicides in the first quarter of 2018, roughly double the percentage in 2012. Last year, the country's homicide rate was 8.1 per 100,000 inhabitants, the second-highest in nearly 30 years, though still far better than the rate for neighboring Brazil. "There have never been as many drug traffickers and drug violence as today," Former President Julio Maria Sanguinetti, an opponent of legalization, told Telemundo television. Olivera and other officials, though, say the plan just needs more time. "It's going to be a year in July since the sale in the pharmacies began," Olivera said. "We never thought about eliminating the black market in a short time; it was always a gradual thing. ... This doesn't happen overnight."